A 17-year-old gorilla was shot dead Saturday at the Cincinnati Zoo after it grabbed a child who had fallen into its enclosure, officials said. 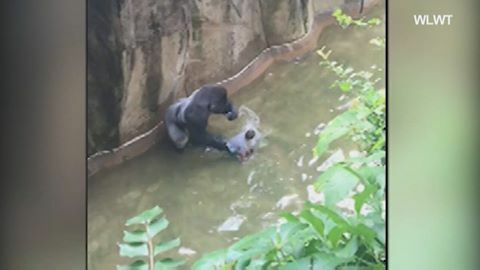 The 4-year-old boy climbed under a railing and through wires before falling about 10 feet into the Gorilla World exhibit at about 4 p.m., said Cincinnati Zoo director Thayne Maynard. First responders “witnessed a gorilla who violently dragged and threw the child,” Cincinnati Fire Department Chief Marc Monahan wrote in a statement. 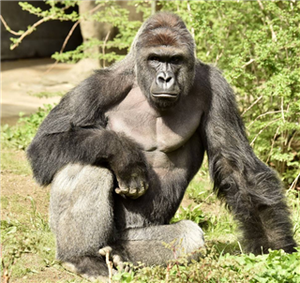 Once “the threat from the gorilla was neutralized by a Cincinnati Zoo employee with one shot from a long rifle,” the child was retrieved and brought to Cincinnati Children’s Hospital with serious injuries, the statement said. The child, who has not been identified, remained conscious during the entire incident, which lasted more than 10 minutes, the statement said. The Associated Press reported that he was expected to recover. The gorilla that was killed was a 400 pound male Western lowland silverback named Harambe, Maynard said. Western lowland silverback gorillas are considered critically endangered, according to the World Wildlife Fund. Maynard said the gorilla didn’t appear to be attacking the child, but he said it was “an extremely strong” animal in an agitated situation. He said the gorilla wasn’t tranquilized because in such a large animal it would take several minutes for the tranquilizer to take effect. 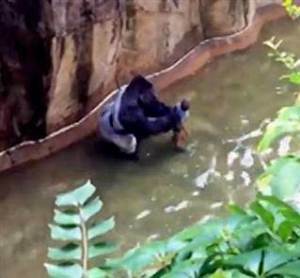 “The Zoo security team’s quick response saved the child’s life,” he added. The outdoor gorilla center has been operational at the zoo for 38 years, and Saturday was the first time a person had gained access inside, Maynard said. The zoo will be open on Sunday, but officials said the gorilla exhibit has been closed until further notice.